Just because I’m posting this Vegan Baked Cheesy Kale Chips recipe today doesn’t mean I just discovered kale chips, or just got on the “kale chip” wagon. No, no, no! 🙂 I’m a big fan of kale chips and have been making them on a regular basis for a long time – over 5 years! 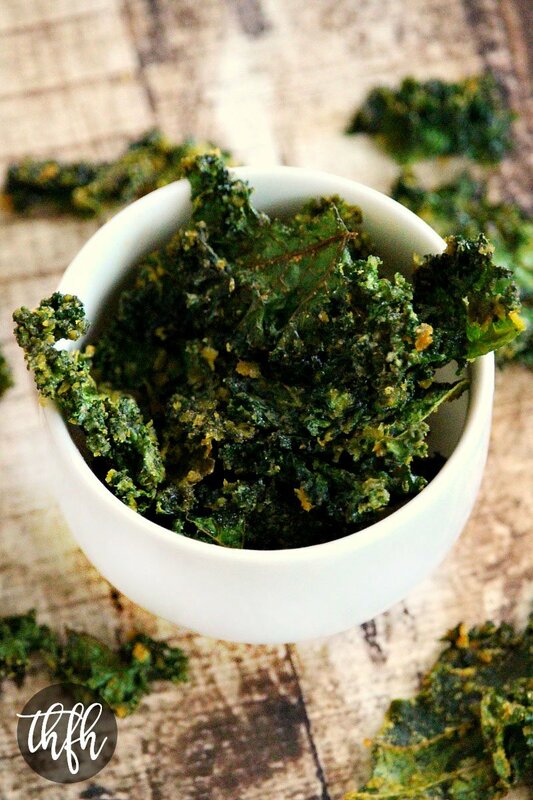 In fact, “Cheezy Raw Kale Chips” was one of the first recipes I posted on my website way back in 2012. But as I was about to make a batch of kale chips to snack on, it just dawned on me that not everyone has a dehydrator ~or~ might not want to pay $5.00 – $6.00 for a small bag of kale chips at Whole Foods. They aren’t considered “raw” since they are baked over 115 degrees, but are just as good as the dehydrator version and take much less time to make. Even thought they aren’t an “apple to apple” comparison to kale chips (especially in taste), they are still basically a bag of GMO’s, food coloring with MSG (monosodium glutamate) and artificial flavorings added in. And they’re not vegan or gluten-free. 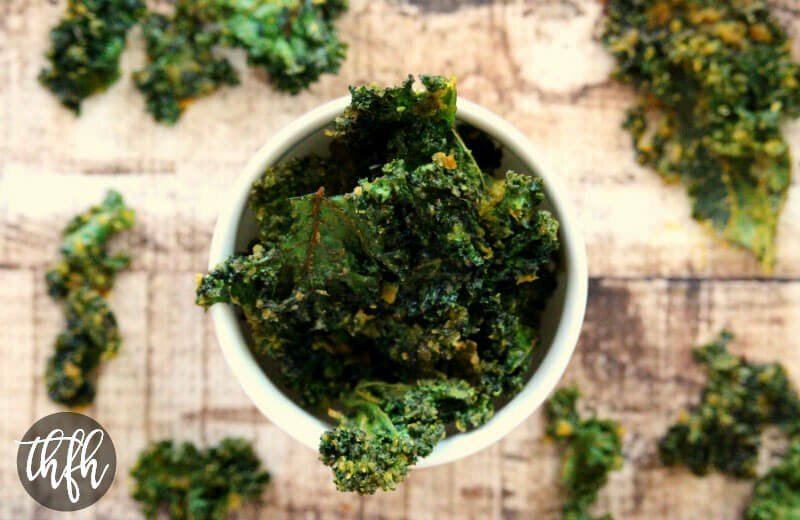 Kale chips are a healthy alternative to store-bought, S.A.D. chips and can replace an unhealthy chip when you want a salty, crispy snack. And, this recipe is vegan, gluten-free, dairy-free, nut-free and paleo-friendly. Want more healthy snack recipes? Check out Garlic and Shallot Fingerling Potatoes, Gluten-Free Vegan Thyme and Garlic Crackers, Roasted Chickpeas with Chipotle and Lime or my Clean Eating Cookbook with an entire chapter of 20 healthy, clean eating snack and side dish recipes just like this one that you will love! Tip #1: I like to use “curly kale” to make my kale chips, but feel free to use your favorite variety. Just make sure to “de-stem” them and remove the thick middle stem and break the kale into bite sized pieces. Tip #2: I like to use 100% pure avocado oil when baking anything in the oven, but feel free to use organic extra virgin olive oil if you don’t have any avocado oil. Either will work fine. I buy both of mine from Thrive Market and have them delivered straight to my door. Prepare the kale: De-stem the kale, break/tear into bite sized pieces and add to a large mixing bowl. Drizzle the avocado oil over the top of the kale pieces and toss them until the avocado oil is evenly distributed, using your hands if necessary. Sprinkle the nutritional yeast and Himalayan salt over the top of the kale pieces and toss again until all is evenly distributed, using your hands if necessary. Adjust seasonings to your preference. 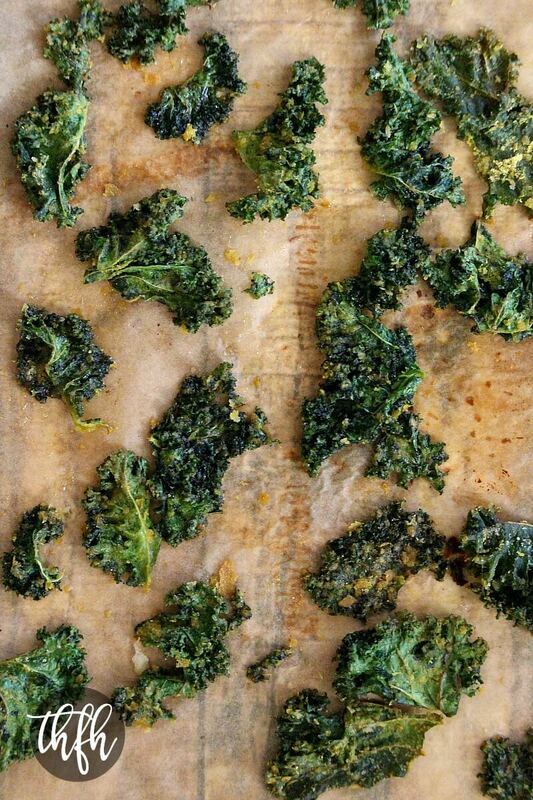 Spread the seasoned kale pieces on a baking sheet lined withe parchment paper and bake at 350 degrees for 6 - 8 minutes. Remove from oven (they will have shrunk in size) and flip the kale pieces over and bake for an additional 6 - 8 minutes, taking care not to over cook or burn them. The recipe and photographs for "Vegan Cheesy Baked Kale Chips" by Karielyn Tillman of The Healthy Family and Home website are licensed under a Creative Commons Attribution Non-Commercial No Derivatives 4.0 International License and cannot be used without my written permission. This recipe looks great! We just got a food dehydrator. This will be also great for the kids who don’t like veggies. They can just eat as chips! Thank you! Hi David! Yay for your new dehydrator…you will love it! These are definitely a win with kids because it’s a struggle sometimes to get mine to eat leafy greens, but they will eat kale chips like they are candy.